Nothing draws attention to a well-rounded and balanced physique quite like full, capped deltoid muscles. Evenly developed deltoids contribute to the aesthetic X-physique by increasing the illusion of broader shoulders and a narrower waist. The deltoid muscle group is made up of three heads: anterior, lateral, and posterior. Many athletes emphasize exercises targeting anterior or front deltoid-dominant which can lead to overdeveloped front delts and underdeveloped lateral and posterior delts. However, no routine is complete without a compound shoulder exercise designed to hammer the front delts. The dumbbell Arnold press is a brutal compound push exercise used to target the anterior or front deltoid muscle. This exercise was popularized by Arnold Schwarzenegger who carried round, cannonball-sized deltoid muscles during the Golden Era of bodybuilding. Stabilizer muscles help maintain a posture or fixate a joint by contracting without significantly moving. Shoulders can be hit with a higher frequency and volume compared to other muscle groups because they're comprised of a higher percentage of slow twitch, endurance muscle fibers. 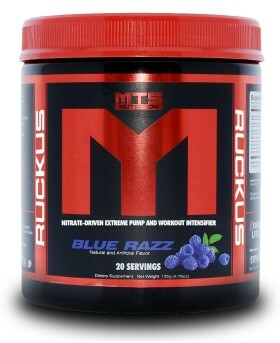 MTS Ruckus is the best nitrate-based pre-workout formula ever. Period. Order now. Begin by approaching the dumbbell rack and selecting the appropriate working weight. If you've previously performed traditional dumbbell overhead press be prepared to start with a lower initial working weight. The dumbbell Arnold press moves your arms and shoulders through an increased range of motion. Ensure you select two dumbbells of equal weight, don't lift 20lbs with your left arm and 35lbs with your right arm. Uneven loading won't improve your gains and will likely lead to an injury. If this is your first time performing the exercise then pick a conservative weight that you can safely lift for 8 to 12 repetitions. Once you've selected the appropriate working weight grasp the dumbbells, pick them up and bring them to your sides. At this point you have two options, you can perform this movement either seated or standing. If you perform this movement standing then take a hip-width stance and ensure your glutes and abdominals remain squeezed throughout the entire movement. If you prefer to be seated, ensure your upper back and glutes remain on the padded supports throughout the entire movement. Now that you've chosen a standing or seated position raise both dumbbells from your sides so that the dumbbells are the same height as your front deltoid muscles, your palms are facing your body (knuckles facing away from you), your elbows are underneath your wrists, your wrists are neutral (not bent forward or backward), and your forearms are perpendicular to the ground. This will be the starting position of the exercise. The dumbbells should not be resting on your shoulders or chest while in the starting position. After setting your starting position take a deep breath, brace your abdominals for impact and begin pushing the dumbbells upwards while rotating your elbows out to your sides. You should be simultaneously pressing and rotating so at the top of the repetition the arms are straight and your elbows are in-line with your shoulders and ears. Assuming you have no shoulder flexibility issues you should be able to completely press the dumbbells until your arms are straight and the dumbbells are almost touching. If you have trouble completely straightening the arms or find your shoulders raising up towards your ears during the pressing portion then lower the weight and focus on improving shoulder flexibility. Once you've held the dumbbells at the top of the movement for the desired duration lower the dumbbells in a slow and controlled motion back to the starting position. The movement pattern for the lowering portion of the lift should be the exact opposite as the pattern used during the pressing portion. You will be simultaneously lowering the dumbbells and rotating your elbows in towards the front of your body. Some lifters choose to exhale while pressing the dumbbells, at the top of each rep, or in between in each repetition. Choose a breathing pattern that feels the most natural and comfortable for you. This exercise can be performed using straight sets, pre-exhaust sets, drop sets, rest-pause sets, supersets, tri-sets, giant sets, paused reps, partial reps, forced reps, or slow negatives. As with any exercise, the two most important components are high-quality form and progression. Progression can take a variety of forms (e.g. more weight, sets, or reps, decreased rest period, improved rep quality, etc...) but strive to improve every time you walk into the gym. Avoid Momentum - Many lifters find flexing the latissimus dorsi (lats) increases the stability at the starting position of the movement. The lats can also be engaged in the bottom position, between each rep to yield a powerful stretch reflex. While this stretch reflex can be beneficial during the transition portion of each rep it's important that you're not relying on it and the momentum it can generate to complete the lift. This exercise primarily targets the shoulders and excessive momentum can lead to poor form which takes the stress off the target muscle groups. Use a Full Range of Motion - While advanced trainees can benefit from partial range-of-motion repetitions, most novice and intermediate trainees will experience maximum benefits from using a full range-of-motion on the dumbbell Arnold press. This means every rep should start with the dumbbells at shoulder level, be pressed until the arms are straight and in-line with the ears and shoulders, and then fully lowered back to shoulder level. A full range-of-motion maximizes time under tension and stimulus on the target muscles. Don't Slam the Dumbbells Together - Many novice and intermediate trainees think a rep on this exercise isn't complete unless the dumbbells slam together and bounce off of each other at the top of the lift. Not only does this bouncing generate momentum, which can minimize the engagement of the target muscle groups, but it also poses an increased risk of personal injury and injury to those around you. If you're slamming the dumbbells together at the top of the rep and lose control of them then you risk dropping the bells on yourself or others. It is okay for the dumbbells to lightly touch at the top of the lift but ensure that touch doesn't turn in to a bounce. 1) "Dumbbell Arnold Press." ExRx (Exercise Prescription) on the Internet. N.p., n.d. Web. 27 Oct. 2015. Griffing, James, et al. "Kinesiology Glossary." ExRx.net. N.p., 2015. Web. 2) "Kinesiology Glossary." ExRx (Exercise Prescription) on the Internet. N.p., n.d. Web. 27 Oct. 2015.